Cyhalothrin is an antiparasitic active ingredient used in veterinary medicine mainly in livestock against external parasites (lice, mites, fleas, flies, ticks, etc.). It is also used against agricultural pests. It belongs to the chemical class of the synthetic pyrethroids. Main veterinary parasites controlled: flies, lice, fleas, mosquitoes, etc. * This information is an indicator of the acceptance of an active ingredient by the most influential regulatory bodies for use on livestock. MRL's for animal tissues may be established also for agricultural pesticides that are not approved for use on animals but are used on commodities fed to animals. It may be also established in the form of an IMPORT TOLERANCE for active ingredients not approved in a particular country but approved for imported animal commodities. In livestock & horses: Yes, as for all synthetic pyrethroids: very frequent worldwide in such species as horn flies (Haematobia irritans), sheep lice (Damalinia ovis), houseflies (Musca domestica), mosquitoes. 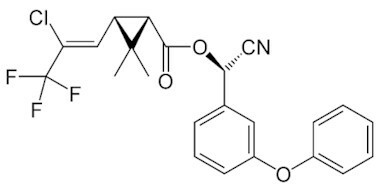 Cyhalothrin is a synthetic pyrethroid particularly effective against insects (flies, lice, mosquitoes), but only mediocre against ticks and mites. As most synthetic pyrethroids, cyhalothrin is a mediocre larvicide, i.e. it is not indicated for the large-scale prevention of cutaneous myiases (e.g. screwworms, blowfly strike, etc.) with sprays, pour-ons, etc. Cyhalothrin, as well as many other synthetic pyrethroids has a significant repellent effect on certain insects, which strongly depends on the delivery form and the dose administered. Cyhalothrin is a mixture of various optic isomers with different insecticidal efficacy. Gamma-cyhalothrin is a pure single isomer with the highest insecticidal efficacy. Commercial products may contain different isomer mixtures. For most users, it often doesn't make any difference regarding efficacy, because if one product uses a mixture with more of the most effective isomers, it will be used at a lower concentration than a product using a mixture with less effective isomers. Although patent has expired long ago, there are only a few generic veterinary products available. However, resistance to cyhalothrin is widespread and can be very high in horn flies (Haematobia irritans), sheep lice (Damalinia ovis), houseflies (Musca domestica), dog and cat fleas (Ctenocephalides spp) and mosquitoes. As a consequence, products with cyhalothrin are already totally useless against such parasites in many places. The same applies to all other synthetic pyrethroids (e.g. cypermethrin, deltamethrin, flumethrin, permethrin, etc.). And this is true for whatever delivery form: dipping, spraying, pour-ons, etc. Topically administered cyhalothrin remains mostly on the hair-coat of the treated animals and is very poorly absorbed through the skin. In contrast with natural pyrethrins and older synthetic pyrethroids cyhalothrin is quite resistant to UV-light, which allows a residual effect between 5 and 10 days for most sprays and dips. Treated animals can ingest cyhalothrin through licking or grooming. A large amount of it is excreted unchanged through the feces. The absorbed cyhalothrin is quickly metabolized in the liver to inactive metabolites that are excreted through urine. This is done by a specific enzyme called glucuronidase. However, cats lack this enzyme and cannot properly metabolize most synthetic pyrethroids. This is why most synthetic pyrethroids are toxic to cats. Synthetic pyrethroids, including cyhalothrin, have a similar mode of action as organochlorines. They act on the membrane of nerve cells blocking the closure of the ion gates of the sodium channel during re-polarization. This strongly disrupts the transmission of nervous impulses. At low concentrations insects suffer from hyperactivity. At high concentrations they are paralyzed and die.